Every once in a great while life hands you a chance to live a dream, if you’re brave enough to take it. Three years ago, when Liz Rowe walked into my life and said, “I heard you’re the person I should talk to about opening an Italian restaurant”, I had just started to find my groove as a retired entrepreneur. All my adult life, I had dreamed of owning a little Italian trattoria. It would have been my next step after I sold Sister’s Italian Food had I not gone into politics. By the time my public service was done, I no longer had a fire in my belly for the long grueling hours of owning a restaurant. Ralph and I had bought our farm and were knee deep into the farmhouse renovation. I was perfectly contented and yet when Liz asked, I agreed. I have had the time of my life. It was everything I’d thought it would be: creative, collaborative, frustrating, grueling, exhilarating and deeply deeply gratifying. I found strength of character in myself that I didn’t know existed. My gratitude, for the faith that Liz and Gord put in me, kept me focused on excellence. I wanted their restaurant to be a success. It is. This past Saturday, I resigned. Liz said she always knew it was never a matter of “if” but rather “when”. It’s time. There are things that I’ve been putting off. We’d made each other’s dream come true. She has her restaurant and I helped her. I thought to myself, how blessed am I.
Whisk together egg yolks, sugar, orange zest, orange juice, and lemon juice in a heavy-bottomed saucepan. Place over medium-high heat, stirring constantly with a heat-proof spatula until the mixture is thick – 8 to 10 minutes. Add salt and butter, one piece at a time, whisking until smooth. Cover with plastic wrap, pressing it directly onto the surface of the curd to prevent a skin from forming. Refrigerate until chilled and very firm, at least 2 hours. 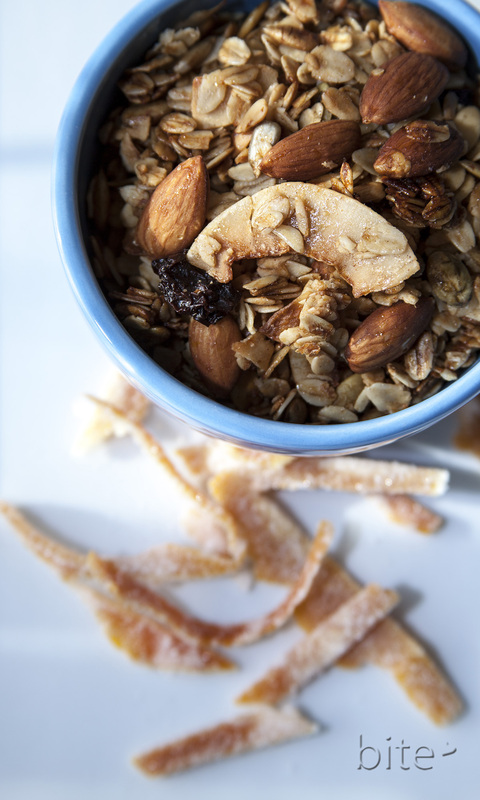 In a large bowl combine oats, coconut, sunflower seeds, pumpkin seeds, pecan halves and salt. In a small bowl mix honey, maple syrup and olive oil with the cinnamon. Pour this over the oat mixture and stir until all ingredients are well coated. Place on a large rimmed baking sheet and bake in the oven 20 minutes. Halfway through cooking stir, and bake for the remaining time. Keep an eye on it as you don’t want the oats to brown too much. Remove from oven, add dried cranberries and stir. If you don’t want to make the candied garnish, use a little freshly grated orange zest! Cut peel lengthwise into 1/3 inch wide strips. Place peel in a deep heavy pot. Cover with cold water by 1 inch and bring to a boil. Repeat blanching 2 more times. Cover peel once more with cold water and simmer until skin is tender – 30 minutes – drain in colander. Return pot to stove and add 6 cups of water and 6 cups of sugar. Bring to a boil, stirring until sugar is dissolved. Add food color and boil syrup without stirring until it reaches 220*F on the candy thermometer – about 30 minutes. Add drained peel and simmer over low heat for 45 minutes or until translucent. Remove from heat and let peel stand in syrup 24 hours, at room temperature. Lift peel from syrup with tongs and spread out on rack. Leave for 24 hours or until syrup has crystallised. Top with a handful of peel then toss in the sugar until it’s well coated. Add more sugar if necessary. The peel will keep for 3 months in a well sealed container layered between pieces of wax paper or in glass jars with tightly fitted lids. Place orange curd in the bottom of clear serving dishes – small mason jars would be adorable! 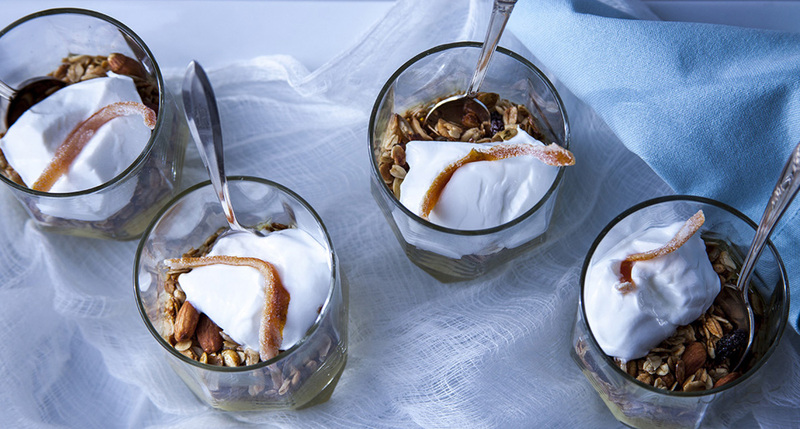 Finish with a big dollop of plain thick Greek yoghurt. Garnish with candied orange peel. 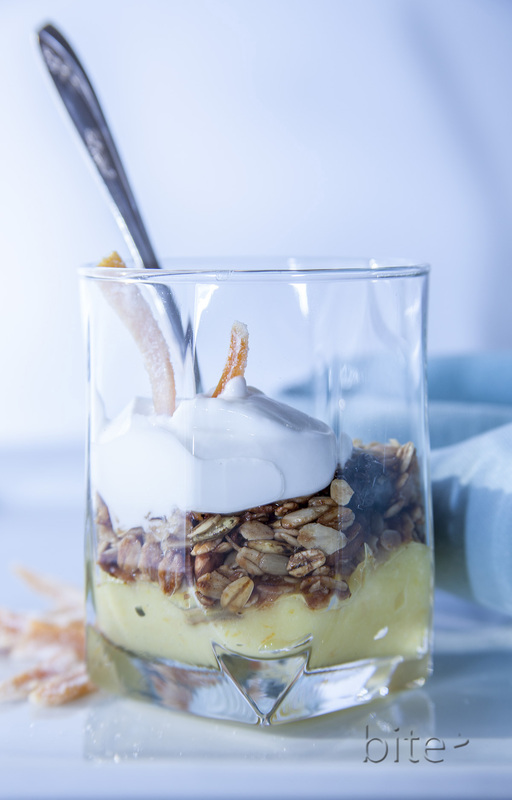 This entry was posted in puddings/mousses and custards and tagged food, Gluten Free, Homemade Granola, Italian by Night, life, Orange Curd, Quick Desserts, recipes by Michelle. Bookmark the permalink.